Rustic elegance in Conifer! 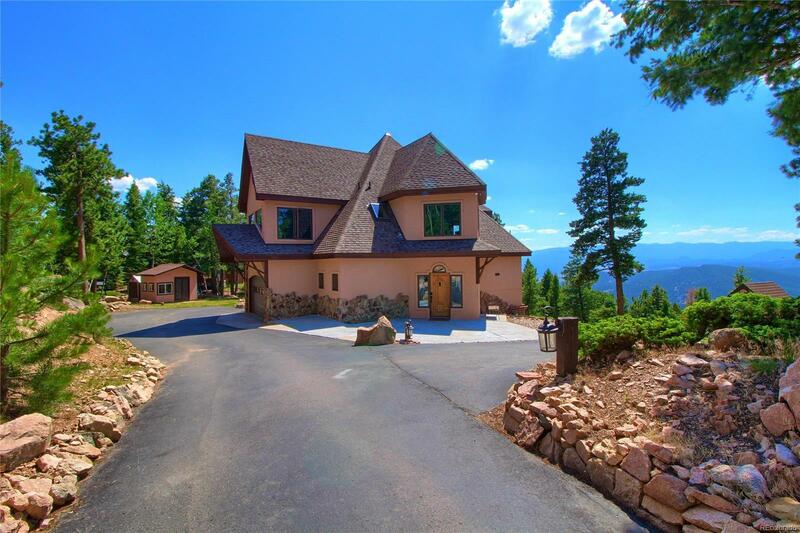 A truly one of a kind mountain home on over 4 acres. You must experience this dramatic architecture in person! Drive into the gated estate with unobstructed mountain views and privacy. Inside you will find an open floor plan with a formal entry way that leads to the custom kitchen featuring slab granite counters, undermount sink, stainless appliances and marble floors. Down a level into the open living/family room with newly finished hardwood floors, wood stove and windows galore. Step outside onto the patio and enjoy the sunsets. Up one level and you will find the huge master bedroom. Wake up every morning to amazing views outside your window. The updated master bathroom features a shower with automatic heat control, a jetted tub and walk in closet. Down the hall is another bedroom w/ensuite bathroom. Up the curved wood stairs to the third bedroom/loft area with dramatic windows and hardwood floors.